(1) The general public doesn’t know anything about the person giving the review (generally speaking). How do I know if I share this reviewers sensibilities? (2) Most reviewers are biased. They are either a friend/relative of the owner and are inclined to say more nice things than are warranted, or they are a competitor/enemy of the owner and are inclined to say more negative things than are warranted. Either way, they are not helpful. (3) What are the customers credentials to give this review? Are they an expert in your business? If not, why are they reviewing it? Expanding on this, we talk with many small business owners and almost all of them have a fear of online reviews. I like to call it the “Yelp factor” – there are so many articles about issues with Yelp. Business owners suing customers. Customers suing Business owners. Businesses suing Yelp! It’s one lawsuit after another. Why would any small business want to subject themselves to this? I’m wildly passionate about this idea even though it may seem minor. Small businesses should be asking for feedback online. A simple “How did we do?” that a customer can respond to. Not only does it help an owner learn more about how their business is perceived, but this feedback can be viewed by others and judged much more independently than 5 star reviews. Studies of popular travel and review sites such as TripAdvisor and Yelp indicate that between 10-20 percent of all reviews are negative. Anecdotally, that seems to be a pretty reasonable percentage of customers who will not be happy with a product or service. So, doesn’t it stand to reason that a business that gets consistent reviews online that are 80-90 percent positive is a solid (and typical) business? Should they be “penalized” for negative reviews? In fact, isn’t a business that has only positive reviews likely less authentic than one that has two negative reviews out of 10? There needs to be an online forum where business owners can get an honest representation of their efforts without gaming the system. Business owners should be actively encouraged to ask for customer feedback (shockingly, this is a violation of Yelp’s terms of service). And while I enjoy Phil’s blogs, I believe that every customer type should be encouraged to give feedback. If I provide you service, I’d like to know what you thought of it. And if I can share that information with potential customers, all the better. It should be noted when the person giving feedback is a friend or relative, but as long as I know that, their opinion could be valuable to me, since they may be my friend or relative too! Bottom line – there is a better way to do this. 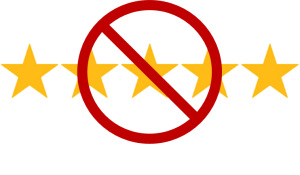 We’ve gotten much too comfortable with 5-star reviews – they are a lazy and inaccurate representation of a business. It’s time to do something new. And it’s time for business owners to take control of their online visibility rather than letting an independent third party control it for them.